Immaculate home in great location. This one owner home has 3 bedrooms & 3 baths w/potential for a 4th bdrm (large bdrm on 2nd level can be split). 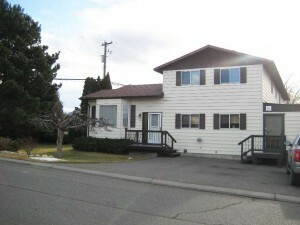 Numerous updates incl flooring, paint, heat pump (central a/c), hot water tank, furnace, roof 10 years old, baths & more. Open great room floor plan on the main floor, kitchen has an island & lots of storage. French door off of the bright living room that leads to a private sundeck/patio overlooking the yard. The laundry is a short distance from the main living space & boasts lots of storage & conveniently located beside the back entrance. Large rec room in the basement w/gas fireplace & lots of storage. Tons of parking, w/room for an RV. This home can also accommodate an inlaw suite. Private landscaped yard w/mature trees for privacy. This is a half duplex home but only shares a very small portion of the wall & entrance is on another road. Feels like a single family home at a great price, you won’t even know you are attached at all.